Designed to give you access to fun-filled Orlando adventures, Hyatt Place Across From Universal Orlando Resort also offers the family-focused amenities that make your stay extraordinary. The hotel offers free transportation to Universal Orlando Resort and other thoughtful extras. The 150 spacious guestrooms are equipped with 42' flat-screen TVs, free Wi-Fi, and upscale bath amenities. Free breakfast is included each morning, and there is all-day dining from the 24/7 Gallery Menu and the 24/7 Gallery Market. The hotel also features a heated outdoor pool and a fitness center. 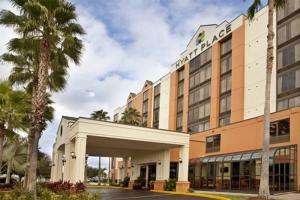 Orlando International Airport is located 16 miles from the hotel.